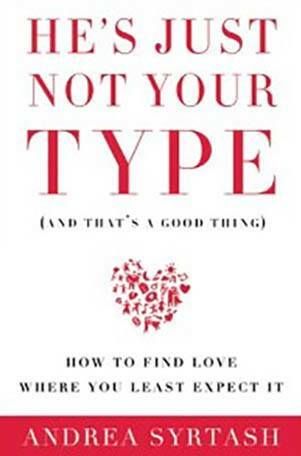 A relationship expert and dating columnist shares her counterintuitive approach to lasting love: encouraging women to date their “non-types” After years of dating, many women fall into a relationship rut. As serial daters, they are attracted to the same type of man time and again. Clearly, something’s not working. But the problem is not that he’s just not that into them—the reality is, he’s just not their type. Relationship expert and life coach Andrea Syrtash hears the disbelief in her clients’ voices when they admit that their “Mr. Right” relationship has again gone wrong. In He’s Just Not Your Type, Syrtash challenges readers to date outside their comfort zones and poses hard-hitting questions: What if the kind of man they think will make them happy never will? What would happen if they dated someone they’d never considered dating? In each chapter, Syrtash shares stories of women who have found lasting happiness with their non-types (NTs) and provides exercises designed to help readers assess their big-picture goals and core values. In doing so, she shows women how to make better choices in dating so they are more likely to find true love.